Moving clockwise from the East we come to the Southern Quarter of creation symbolizing our passions, energy, the spark of life, manifestation and youthfulness. Where East was very mental, the direction South is physical. It is here that we learn to know and trust our bodies. South is also filled with relationship vibrations, particularly our ability to love fully and freely and become fully engaged situationally or emotionally. The negative aspect of the Southern Watchtower is anger or rage. In working with this metaphysical source, one must remember that anything you’ve pushed down is bound to come back out, sometimes as an eruption. That’s one of the lessons we learn here, as well as how to control those resentments and turn the energy into something more positive. Stand facing the south when the wind blows gently. Feel that warmth? Heat is part of the South’s dynamic. It’s alive. It’s growing. It is abundant and lush; this is an excellent direction with which to work when your energy reserves seem to have bottomed out, or when you’ve forgotten the importance of play in your life. Kick off your shoes, run barefoot and play with the Guardians of the South with respectful abandon. Where East represent the Air element, South symbolizes Fire. It is the fire in our blood; the fire of the sun; the fires of refinement and indeed Divine fire. The creatures who inhabit fire are called Salamanders, and they know the power of joy. For them there is no past or future – only the NOW. In this, Fire and South ask us if we are living in the moment, fully experiencing, feeling and integrating? If not, stop and smell the flowers! There is beauty everywhere just waiting for a watchful eye. There is a strong illumination factor with Fire and the South; this includes not only spiritual awakenings but also insights. When working with this Quarter, you may find your psychic self tuning into minutia that once were overlooked. Remain receptive to the gifts and messages. The direction of south correlates to the season of summer in intensity. At this time of year, the earth is in its abundance. The energy of opportunity springs forth everywhere just waiting for your exploration. If doors open even a crack, peek in with gleeful expectation. Let your inner child find a new place in your life and know what it is to be truly ALIVE. To increase your awareness of Summer and South in your life wear bright, vibrant colors! Release yourself to expressiveness (political correctness – forget it!). Summer and South both council – go big or go home! The significance of the Southern Quarter of a magic circle is very similar in tenor to everything discussed thus far. It is the “go to” center for action, relationships, activities, the balance between work and relaxation, health, organization and putting forth goals for manifestation. Spells and rituals focused on the South are typically those for drawing courage or love, sparking the enterprising spirit, personal or group attainment, accomplishment, refinement, renewal, and zeal. The South is a drama King. Think about how hard it is to ignore a fire — no matter the size they capture our attention. With this in mind, South can be a good direction for bringing attention to your positive characteristics or efforts that one might overlook. The symbol for South is a sword or athame. A candle may also substitute. Key colors include Gold, red and orange (however the Fire element has other noticeable hues with distinct personalities). The best time to work with Southern energies is when the moon is in the 2nd quarter, and the sun is high in the sky (Noon). A fair amount of Southern magick includes the fire element for apparent reasons. Thus the reason many practitioners use candles. These represent the direction/element while also being useful tools for focusing spells and rituals. Crystals: Many red, orange, and yellow stones including Fire Agate, Fire Opal, Amber, and Sunstone (see also Fire Elemental). Dreams: Traveling southward in a dream may mean something is going downhill. However, if this trip is not the first one in the dreamscape, it may also be a “living” dream of past lives or memories that you’ve buried. You can learn more specifics about dream images in our Dream Dictionary. Feng Shui: In Feng Shui (the art of placement), the direction South represents personal reputation and renown. The area supports the image you wish to project of yourself – your true identity and principles rather than what they see superficially. As with the other traditions discussed, Feng Shui correlates the South to fire and uses reds, purple, pink, bright yellow or orange for hues. Use these colors in various decorations that represent the best of your ideals to strengthen the associated Chi energy throughout your home. There isn’t a lot written about the South in Celtic myths. What we find shows this direction as being associated with the here-and-now, our inner fire, inventiveness, and our passions. There are some indications that the Celts may have felt the South was feminine in nature, having the creative nature of water particularly for performing arts and the vibration of illumination. In writing about Native American correspondences, please remember that these are generalized. When you explore different tribes closely, you will find differences suited to their mythology and lifestyle. The global view of the Southern direction was a place of faith, love, emotional growth and insight, transmutation, cleansing, healing and the “tribe” as a whole. 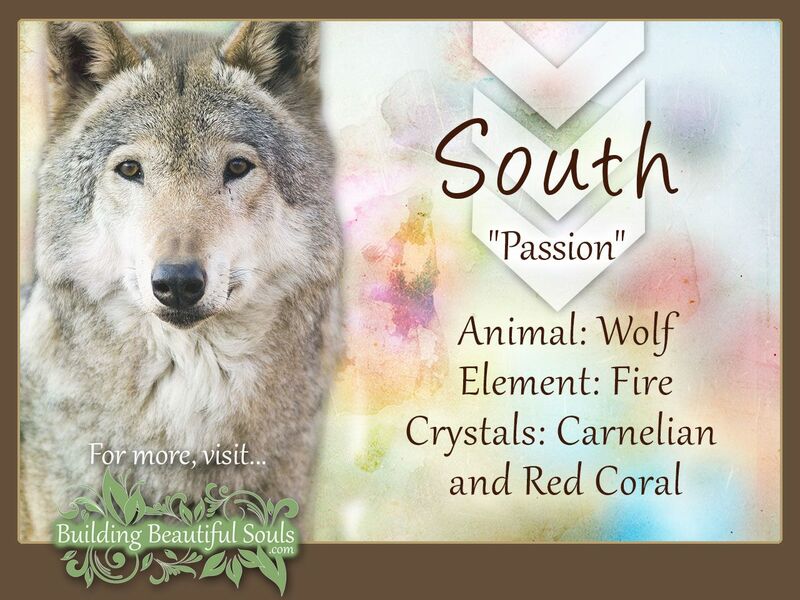 South is Earth’s spirit center. It symbolizes regeneration and harmony with self and others. Some tribes connect the South with our ability to plan, communicate, understand and establish. It is also a space in which one can release the past to embrace the future. The relationship to the season of Summer, the hour of Noon and the color red remain consistent. Sacred animal spirits associated with the South include the Fox, Badger, and Coyote. In the Bible, the direction South is associated with an unknown wilderness. Even so, it was in the south where God chose to appear to Moses as the burning bush, which began the liberation of the Tribes. With this in mind, this direction becomes a symbol of enlightenment (en-LIGHT-enment) and finding God’s will and Universal Truths. It also represents learning in such a way as to make esoteric concepts alive and vital in daily living. The direction of South in Buddhism belongs to Virudhaka one of the four heavenly kings. His name means “he who causes growth” and his symbol is the sword (similar to the Tarot’s designation). The creature that abides in this region is the Firebird or red bird that we call the Phoenix which can rise from the ashes. In the art of the Far East, this bird often appears with a dragon as a symbol of marital bliss along with all its mortal conflicts. In Hindu tradition, the God of the south is Yama/Dharma, the guardian of the south is Varahi whose weapon is the staff, and the governing planet is Mars. The Southern direction corresponds with a variety of symbolism based on culture and the context in which the direction is viewed. By understanding the symbols related to the direction, you can add layers of meaning to ritual work, spells, meditations, writings, and more. Symbolic understanding of the cardinal direction of South may even help you when it comes time to interpret dreams if symbols relating to the direction appear in a dream narrative. One thing is clear, the South is more than a mere compass point or a direction of movement. It is rich in meaning and can enrich how you view and interact with the world if you familiarize yourself with its symbolic meaning.